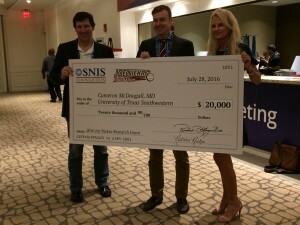 The Joe Niekro Foundation was pleased to award $60,000 in research seed grants at the 2016 SNIS Annual Meeting in Boston this July. Among a pool of thirteen amazing applications, the Grants Review Board selected three to each receive a $20,000 seed grant that advances the study of brain aneurysms or brain arteriovenous malformations. The grants enable investigators to conduct research projects that address a specific hypotheses and generate preliminary data in preparation for major grant applications to corporations, foundations and governmental agencies. 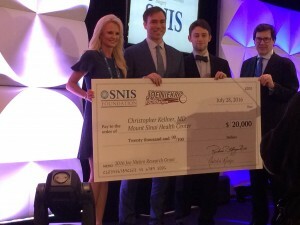 Founder of the Joe Niekro Foundation, Natalie Niekro and Treasurer of the SNIS Foundation, Richard Klucznik, MD presented each recipient with their checks. We applaud all those that applied and look forward to granting additional dollars at the 2017 Annual Meeting in Colorado Springs in July. (Dr. Mitha was unable to attend the meeting and therefore not pictured. Congratulations to Drs. Kellner, McDougall and Mitha from all of us at the Joe Niekro Foundation™!